On March 7, 2019, U.S. Representatives Karen Bass (D-CA-37) and Brian Fitzpatrick (R-PA-1) introduced a bipartisan bill to reauthorize the Violence Against Women Act (VAWA), H.R. 1585. The bill retains the baseline housing protections in VAWA 2013 and includes amendments that would strengthen VAWA’s emergency transfer and lease bifurcation remedies; address the need for proper VAWA implementation and compliance; as well as protect VAWA survivors’ right to report crime and support effective law enforcement. 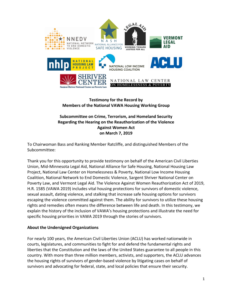 NHLP and other members of the National VAWA Housing Taskforce submitted written testimony for the record following the U.S. House Subcommittee on Crime, Terrorism, and Homeland Security’s Hearing on the Reauthorization of the Violence Against Women Act on March 7, 2019. The testimony describes these amendments and the need for them. Importantly, VAWA 2013’s housing protections continue to be in effect. These safeguards did not expire when Congress failed to reauthorize VAWA last year. Therefore, VAWA 2013’s statutory housing provisions and related implementing regulations and guidances by HUD and RD are still in force.